Electrical systems Huge panoramic windows, frequently spanning several floors of the same building, are one of the key features of the modern architecture. We want to be open to the world and let into our interiors as much light as it is possible. It gives us the sense of freedom and unity with nature. However, if we live in a metropolis pulsating with life until late hours, we finally reach a moment when we wish to feel safe and at ease in our home oasis. When we experience that need, the best solution are curtain and roller-blind systems with electric drives. They guarantee comfort and easy use. That type of drives for Roman shades are offered by Marcin Dekor company. That simple method allows us to control the blinds without the need to pull the propelling chain or cord. All we have to do is press the right button on the remote control or switch to start the drive. Frequently electrical control is chosen out of necessity, fox example in situations when blinds are located in hard-to reach places –such as great heights, when their dimensions are spectacular or they are made of heavy fabrics. Marcin Dekor offers several types of wireless control systems: control with the use of a remote control, wall switch or combined systems composed of remote controls and switches. It is also possible to integrate the blinds control system with intelligent building control systems. We may choose among two types of motors: 24V motors used for driving lighter and smaller blinds (that motor may lift a shade weighting up to 4,5kg) and a motors with voltage of 230V with maximum lifting capacity of up to 15kg. You should also pay attention to another two system types: MD- LINE and MD-LINE PLUS. They are high-class curtain rods with electrical drive characterised by quiet work, reliability and easy use. These systems have proven to be ideal drives for net curtains and curtains in flats, detached houses and public utility buildings. 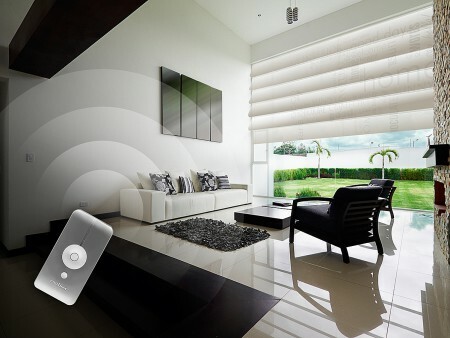 Just like the blinds, these systems may be wirelessly controlled: with a pilot, wall switches or combined systems composed of remote controls and switches. Electrical curtain rod systems are also compatible with intelligent building control systems. One of the most important features of these system is the possibility of bending the curtain rods to form arches and point bending. Another advantage enhancing the functionality and comfort of use of that control system is TOUCH MOTION function, which allows the users to activate the drive by delicately pulling the fabric. An important and necessary action required in case of these systems is prior designing of an appropriate electrical installation during the phase of designing the interior. It is useful to contact the dealer beforehand and get additional information.